The race: The organizer provided this explanation of the day's racing. 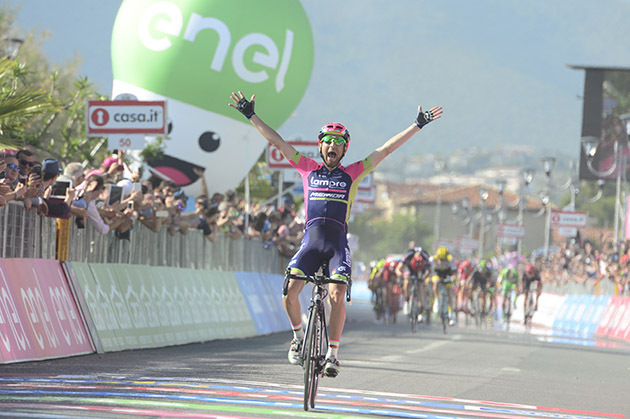 The Italian rider Diego Ulissi (Lampre – Merida) won Stage 4 of the 99th Giro d’Italia, Catanzaro – Praia a Mare (200km). 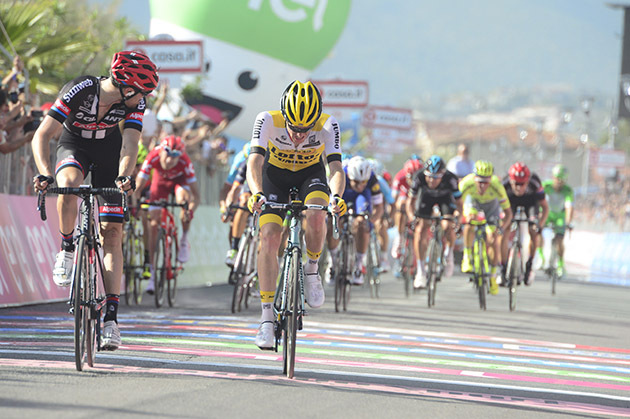 Tom Dumoulin (Team Giant – Alpecin) and Steven Kruijswijk (Team Lotto NL – Jumbo) finished second and third. Thanks to his second place, Tom Dumoulin (Team Giant – Alpecin) is race leader once more, and takes the Maglia Rosa. 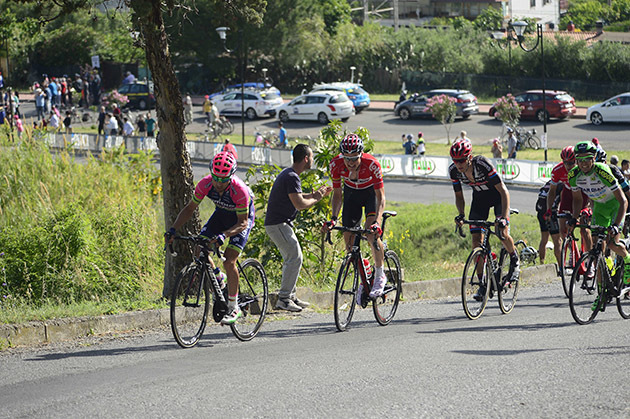 Stage winner Diego Ulissi said: “I’m extremely happy. My victory comes after enormous team work. Valerio Conti managed to create the small group and I rode away knowing that, on the final descent, the peloton of chasers would go even faster than me. I gave it everything I had. It’s a huge emotion”. Seconds after the stage finish, the new race leader Tom Dumoulin said: “It’s great to get the Maglia Rosa back. That’s what we were working for today. We sent Georg Preidler into the last breakaway. It would have been perfect if he had taken the race lead but it wasn’t to be. 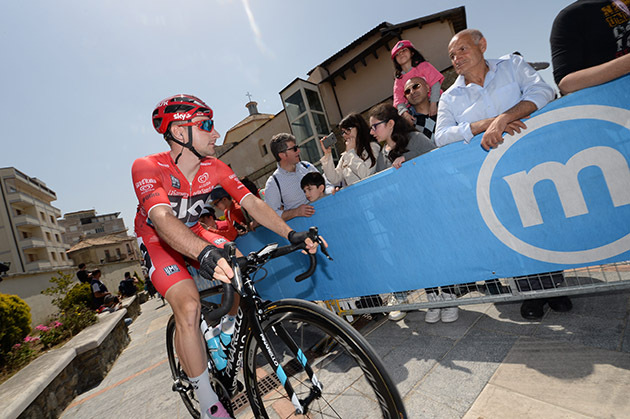 At the last gasp, I tried for the stage win but Ulissi was just too strong”. 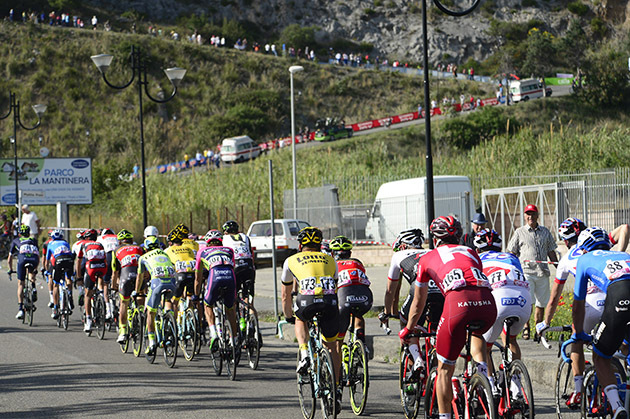 As action resumed after the rest day, the peloton took on 200km of racing from Catanzaro to Praia a Mare with Four riders forming the early break. In the early part of the race, Etixx Quick Step took up the chase and the gap never exceeded a maximum of 3 minutes. 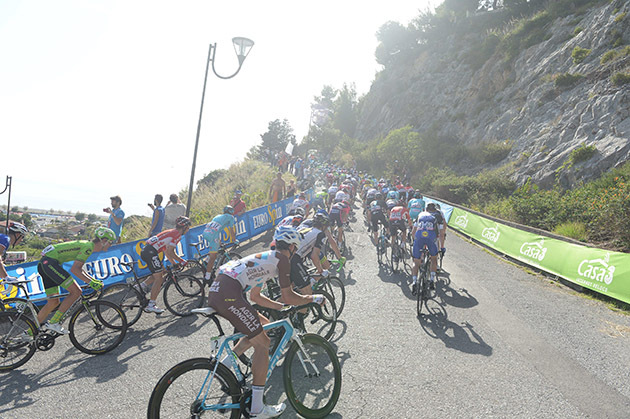 However on the San Pietro climb, the race came to alive with our guys putting on an impressive show of teamwork at the front to decimate the peloton and see some of the sprinters drop including Kittel. As the reduced bunch headed into the final 20km lots of attacks took place as we had Tom Dumoulin and Georg Preidler at the front on the final climb of the day. Diego Ulissi (Lampre – Merida) won the stage after a late attack as Tom Dumoulin sprinted to an impressive second place and regained the pink jersey. In the overall classification now, Tom Dumoulin is in the lead with an advantage of 20" over the second place. It was also a huge performance by Georg Preidler who is now fifth overall. Tom Dumoulin gave his thoughts after the stage: “We knew that the finale was hard but we weren’t sure if it was too difficult for Kittel. 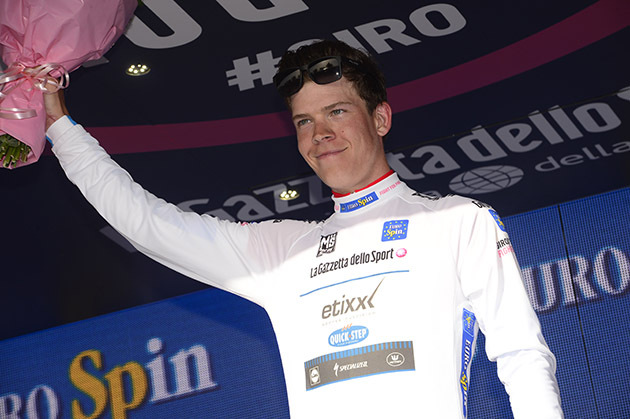 I was feeling good at the start of the stage and we really wanted to regain the pink jersey. “We made a plan to pull on the 2nd category climb and we were able to drop Kittel. From then on the race was completely uncontrollable but we had four guys in the top 10 so we had several cards to play with. “On the final climb, Georg was really strong and could follow the late attack. 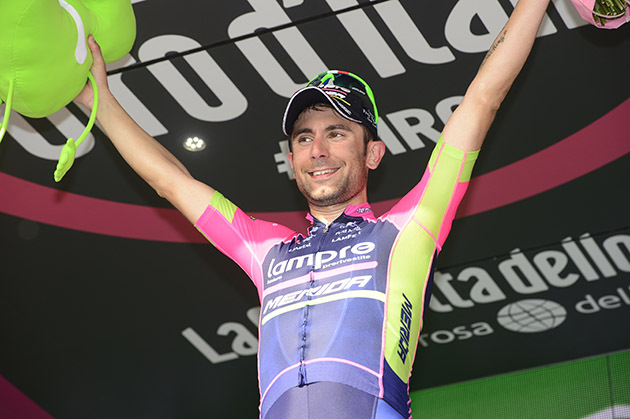 It would have been really nice if he could have taken the stage win and the pink jersey. In the finale, our aim was to play it smart and get in a good position, as there were not a lot of riders left in the bunch. It is fantastic to be back in the pink jersey, which is what we were aiming for at the start of today. Coach Marc Reef said after the race: “It was a very fast start to the race today with some dangerous riders for the GC in the early break. Therefore, the bunch was always in control and the gap never exceeded the 3. “The plan before the stage was to race offensively and we decided to open up on the first climb of the day. We needed to do something because we had four guys in the top 10 and there was a big possibility to go for a stage victory or to regain the leader’s jersey. Weather: Catanzaro: Sunny, 21°C. Wind: weak – 15 kmh. Praia a Mare (approx. 17.15 – Finish): Sunny, 21°C. Wind: weak – 5 kmh. 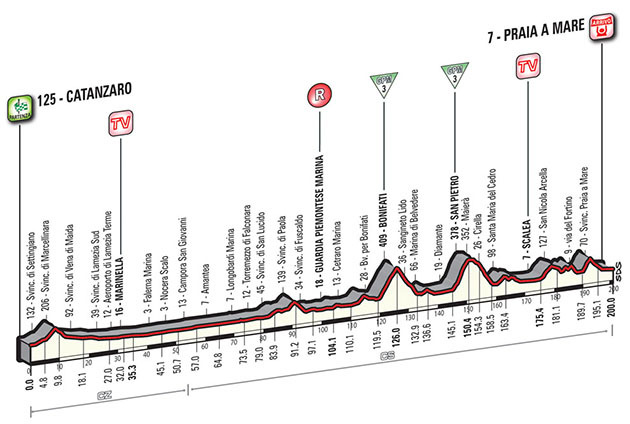 The Route: The stage is twisting, but the first 120km are relatively straightforward. The route winds its way along wide fast-flow roads, which feature a few tunnels. Past Cetraro Marina, the route takes in the Bonifati climb and dives into the ss. 18 trunk road, then leaves it to tackle the second categorised climb of the day in San Pietro (with high gradients along the first half). 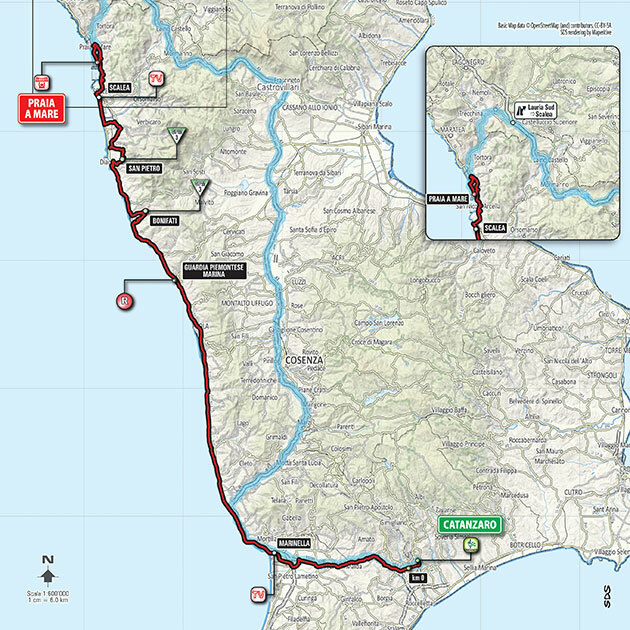 The route grows harder after the intermediate sprint in Scalea, with many climbs and descents, and twists and turns that lead into the final 10km. The final kilometres are rather bumpy. 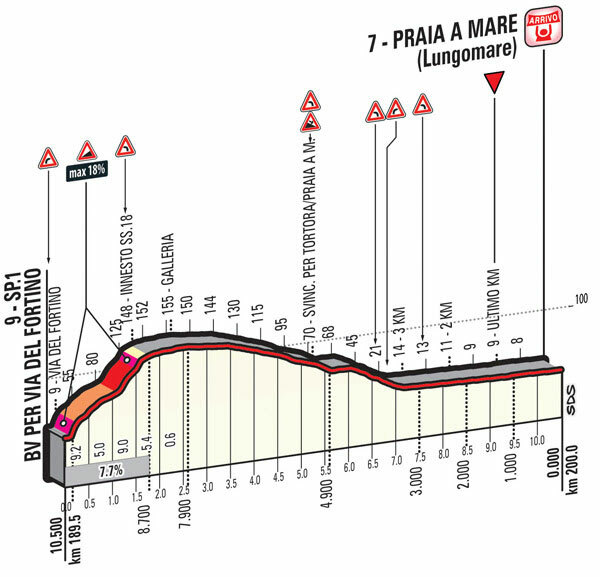 With 10km remaining to the finish, the route takes in the very steep Via del Fortino climb (with ramps topping out at 18%), and then drops into Praia on wide and curving roads that pose no real challenge. Beware of two tunnels in the first part of the descent (the least steep). The home straight is 2,500m long, on a 7.5m wide asphalt road, curving just slightly, 40m before the finish. 3 KRUIJSWIJK Steven LOTTO NL-JUMBO s.t. 6 NIBALI Vincenzo ASTANA s.t. 7 ZAKARIN Ilnur KATUSHA s.t. 8 BUSATO Matteo WILIER TRIESTINA s.t. 10 ROCHE Nicholas SKY s.t. 11 FIRSANOV Sergey GAZPROM-RUSVELO s.t. 12 MAJKA Rafal TINKOFF s.t. 13 PREIDLER Georg GIANT-ALPECIN s.t. 14 POZZOVIVO Domenico AG2R-LA MONDIALE s.t. 15 SIUTSOU Kanstantsin DIMENSION DATA s.t. 17 TAARAMAE Rein KATUSHA s.t. 18 KOCHETKOV Pavel KATUSHA s.t. 19 FUGLSANG Jakob ASTANA s.t. 24 PIRAZZI Stefano BARDIANI CSF s.t. 25 LOPEZ GARCIA David SKY s.t. 26 COLBRELLI Sonny BARDIANI CSF s.t. 28 MCCARTHY Jay TINKOFF s.t. 29 MORI Manuele LAMPRE-MERIDA s.t. 31 DE LA CRUZ David ETIXX-QUICK STEP s.t. 32 MOSER Moreno CANNONDALE s.t. 34 VISCONTI Giovanni MOVISTAR s.t. 37 SBARAGLI Kristian DIMENSION DATA s.t. 38 POLJANSKI Pawel TINKOFF s.t. 39 ATAPUMA Darwin BMC s.t. 40 MONTAGUTI Matteo AG2R-LA MONDIALE s.t. 41 ANTON Igor DIMENSION DATA s.t. 42 HESJEDAL Ryder TREK-SEGAFREDO s.t. 43 HENAO Sebastian SKY s.t. 44 BOSWELL Ian SKY s.t. 45 BONGIORNO Francesco BARDIANI CSF s.t. 46 KANGERT Tanel ASTANA s.t. 47 SILIN Egor KATUSHA s.t. 48 ROVNY Ivan TINKOFF s.t. 50 TCATEVITCH Alexey KATUSHA s.t. 53 TRENTIN Matteo ETIXX-QUICK STEP s.t. 54 NIZZOLO Giacomo TREK-SEGAFREDO s.t. 55 MODOLO Sacha LAMPRE-MERIDA s.t. 56 CONTI Valerio LAMPRE-MERIDA s.t. 57 BROWN Nathan CANNONDALE s.t. 59 DEIGNAN Philip SKY s.t. 60 KUDUS GHEBREMEDHIN Merhawi DIMENSION DATA s.t. 61 DUPONT Hubert AG2R-LA MONDIALE s.t. 62 KUNG Stefan BMC s.t. 63 BETANCUR Carlos A. MOVISTAR s.t. 64 HOULE Hugo AG2R-LA MONDIALE s.t. 67 ARNDT Nikias GIANT-ALPECIN s.t. 72 DEMARE Arnaud FDJ s.t. 74 MALACARNE Davide ASTANA s.t. 75 HAUSSLER Heinrich IAM CYCLING s.t. 76 BONNAFOND Guillaume AG2R-LA MONDIALE s.t. 77 DIDIER Laurent TREK-SEGAFREDO s.t. 78 ZILIOLI Gianfranco NIPPO-VINI FANTINI s.t. 80 AGNOLI Valerio ASTANA s.t. 81 PETROV Evgeny TINKOFF s.t. 82 BELLETTI Manuel WILIER TRIESTINA s.t. 83 WELLENS Tim LOTTO-SOUDAL s.t. 87 ROJAS GIL Jose Joaquin MOVISTAR s.t. 88 PLAZA Ruben ORICA-GREENEDGE s.t. 89 NIEVE Mikel SKY s.t. 90 MAESTRI Mirco BARDIANI CSF s.t. 91 BAK Lars Ytting LOTTO-SOUDAL s.t. 92 GREIPEL Andre' LOTTO-SOUDAL s.t. 93 HANSEN Adam LOTTO-SOUDAL s.t. 94 HOWSON Damien ORICA-GREENEDGE s.t. 95 DENIFL Stefan IAM CYCLING s.t. 100 KUZNETSOV Viacheslav KATUSHA s.t. 103 KOLOBNEV Alexandr GAZPROM-RUSVELO s.t. 106 ALAFACI Eugenio TREK-SEGAFREDO s.t. 107 BETTIOL Alberto CANNONDALE s.t. 108 ZOIDL Riccardo TREK-SEGAFREDO s.t. 109 OSS Daniel BMC s.t. 110 CICCONE Giulio BARDIANI CSF s.t. 111 MORENO Javier MOVISTAR s.t. 112 BRUTT Pavel TINKOFF s.t. 113 CLARKE Simon CANNONDALE s.t. 114 VAUGRENARD Benoit FDJ s.t. 115 NAVARDAUSKAS Ramunas CANNONDALE s.t. 117 VANENDERT Jelle LOTTO-SOUDAL s.t. 120 DOMONT Axel AG2R-LA MONDIALE s.t. 122 SUTHERLAND Rory MOVISTAR s.t. 123 KOSHEVOY Ilia LAMPRE-MERIDA s.t. 124 NIEMIEC Przemyslaw LAMPRE-MERIDA s.t. 125 VAN ZYL Johann DIMENSION DATA s.t. 126 MOHORIC Matej LAMPRE-MERIDA s.t. 127 ZABEL Rick BMC s.t. 128 ROSSKOPF Joseph BMC s.t. 129 HOFLAND Moreno LOTTO NL-JUMBO s.t. 130 KEIZER Martijn LOTTO NL-JUMBO s.t. 131 CASTELIJNS Twan LOTTO NL-JUMBO s.t. 132 LIGTHART Pim LOTTO-SOUDAL s.t. 133 BERTAZZO Liam WILIER TRIESTINA s.t. 134 KOZHATAYEV Bakhtiyar ASTANA s.t. 135 FOLIFOROV Alexander GAZPROM-RUSVELO s.t. 136 LE GAC Olivier FDJ s.t. 137 RYBALKIN Aleksey GAZPROM-RUSVELO s.t. 138 COURTEILLE Arnaud FDJ s.t. 139 SEROV Alexander GAZPROM-RUSVELO s.t. 140 HERNANDEZ Jesus TINKOFF s.t. 141 WARBASSE Lawrence IAM CYCLING s.t. 142 KITTEL Marcel ETIXX-QUICK STEP s.t. 143 SABATINI Fabio ETIXX-QUICK STEP s.t. 144 SENNI Manuel BMC s.t. 146 VOROBYEV Anton KATUSHA s.t. 147 FERRARI Roberto LAMPRE-MERIDA s.t. 148 BERLATO Giacomo NIPPO-VINI FANTINI s.t. 149 JIM Songezo DIMENSION DATA s.t. 150 STAMSNIJDER Tom GIANT-ALPECIN s.t. 151 VAN POPPEL Boy TREK-SEGAFREDO s.t. 152 HERRADA LOPEZ José MOVISTAR s.t. 153 LAENGEN Vegard Stake IAM CYCLING s.t. 156 GRETSCH Patrick AG2R-LA MONDIALE s.t. 157 CANCELLARA Fabian TREK-SEGAFREDO s.t. 162 VIVIANI Elia SKY s.t. 163 SIMION Paolo BARDIANI CSF s.t. 164 DELAGE Mickael FDJ s.t. 165 TJALLINGII Maarten LOTTO NL-JUMBO s.t. 167 PELUCCHI Matteo IAM CYCLING s.t. 170 BELKOV Maxim KATUSHA s.t. 171 WISNIOWSKI Lukasz ETIXX-QUICK STEP s.t. 172 SUTTERLIN Jasha MOVISTAR s.t. 173 RUFFONI Nicola BARDIANI CSF s.t. 174 FISCHER Murilo Antonio FDJ s.t. 175 BOLE Grega NIPPO-VINI FANTINI s.t. 177 FILOSI Iuri NIPPO-VINI FANTINI s.t. 178 STACCHIOTTI Riccardo NIPPO-VINI FANTINI s.t. 179 KADRI Blel AG2R-LA MONDIALE s.t. 180 OVECHKIN Artem GAZPROM-RUSVELO s.t. 181 FRAILE MATARRANZ Omar DIMENSION DATA s.t. 182 AMEZQUETA Julen WILIER TRIESTINA s.t. 183 BOEM Nicola BARDIANI CSF s.t. 184 HEPBURN Michael ORICA-GREENEDGE s.t. 185 BRANDLE Matthias IAM CYCLING s.t. 186 BOBRIDGE Jack TREK-SEGAFREDO s.t. 187 BEWLEY Sam ORICA-GREENEDGE s.t. 189 DE BACKER Bert GIANT-ALPECIN s.t. 190 TUFT Svein ORICA-GREENEDGE s.t. 191 THOMSON Jay Robert DIMENSION DATA s.t. 192 MARECZKO Jakub WILIER TRIESTINA s.t. 193 ROGLIC Primoz LOTTO NL-JUMBO s.t. 194 YAMAMOTO Genki NIPPO-VINI FANTINI s.t. 195 ANDREETTA Simone BARDIANI CSF s.t. 5 PREIDLER Georg GIANT-ALPECIN s.t. 10 CHAVES Esteban ORICA-GREENEDGE s.t. 23 FIRSANOV Sergey GAZPROM-RUSVELO s.t. 24 BRAMBILLA Gianluca ETIXX-QUICK STEP s.t. 26 KANGERT Tanel ASTANA s.t. 30 BUSATO Matteo WILIER TRIESTINA s.t. 34 NIZZOLO Giacomo TREK-SEGAFREDO s.t. The finish line is only 10 kilometers away. 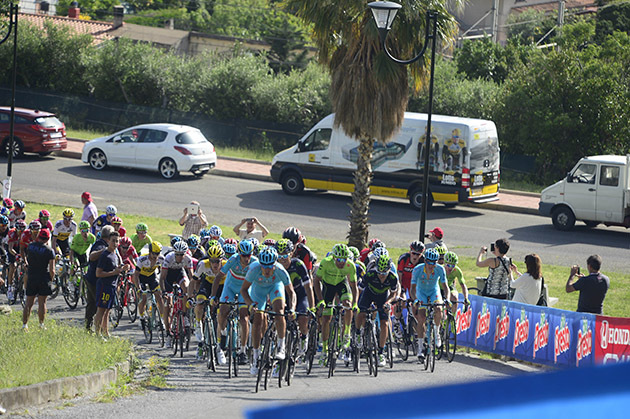 But it's Diego Ulissi (in front) dropping the hammer and getting away. Tom Dumoulin just beats Steven Kruijswijk for second place to become the new GC leader.